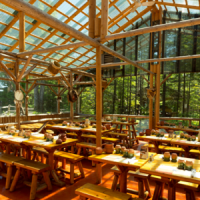 Located in the traditional Huron-Wendat site Onhoüa Chetek8e, Nek8arre Restaurant brings you to the next level. It offers Aboriginal cuisine like you would never have expected : duck, buffalo, wapiti, and sunflower seeds soup. A place for the whole family.